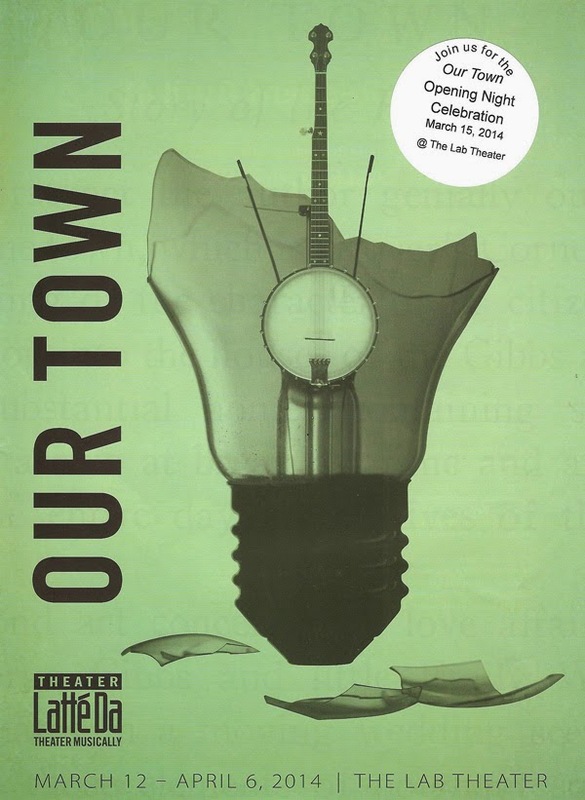 Thornton Wilder's Our Town is an American classic, first produced over 70 years ago, and continuing through the years with frequent productions in theaters and schools around the country. It's a simple story really; its three acts explore the ideas of "Daily Life," "Love and Marriage," and "Death and Dying" through the interconnected residents of Grover's Corners. But it's really quite profound in its simplicity, the final act being especially poignant as it forces us to look at the beauty of every day life and communion with our fellow human beings, something that is often overlooked in the busyness of life. Theater Latte Da adds their usual musical style to the piece, with direction by Peter Rothstein and Music Direction/ Arrangement by Denise Prosek, in a way that enhances but never detracts from the story. The result is truly a beautiful experience that transcends mere theater. The play is written in an unusual style, in which a character known as "Stage Manager" (played by the incomparable Wendy Lehr, recently named the McKnight Foundation's Distinguished Artist of 2013) serves as narrator, and fully acknowledges that this is a play, introducing scenes and cutting them off when time is short. He, or in this case she, speaks directly to the audience as she tells us the story of this extraordinarily ordinary town. We meet many people in the town, from the milkman to the constable to the town drunk, but the focus is on the Gibbs and Webb families. George Gibbs and Emily Webb (David Darrow and Andrea San Miguel, both utterly charming and charismatic) are teenagers and best friends in the first act, and the second act features their wedding at a young age. The third act takes place in the cemetery, with the deceased observing and commenting on the living. Emily has died in childbirth, and wants to relive one mundane day in her life, against the advice of the other residents of the cemetery. She chooses her 12th birthday, but finds that it's too painful to watch the careless way her family goes about the day, not realizing how precious each moment is, and begs to be returned to her grave. Theater Latte Da "does theater musically," so they've added music to their production of Our Town in a really effective and organic way. * It's not a musical where characters break out into song, in fact songs never interrupt the flow of dialogue. Occasionally there is a soft musical undertone in some of the scenes, adding ambiance and color to the story, but most of the music comes before the show and during the two intermissions, when the cast (most of whom play instruments) sings and plays songs of the American Songbook, from traditional folk songs to Stephen Foster and Irving Berlin. It's as if we're watching a community celebrate and share music in between telling us their story (although it belies the line about there not being much interest in art and culture in Grover's Corners). Our Town is meant to have minimal sets, but this production takes it to the extreme. Walking into the gorgeous open space at the Lab Theater, the stage area contains only musical instruments and a few stools. Not much more is added during the play, other than a few chairs, benches, and ladders. It's extremely minimal, allowing the focus to be on the story and the music. The audience sits on both sides of the stage area, adding to the community feeling. The simple light bulbs hanging from the ceiling, occasionally lowered or darkened as the scene calls for, completes the mood of the piece. Warm and wonderful performances by all four actors playing the parents - Brian Grandison and Sara Ochs as Dr. and Mrs. Gibbs, and Isabell Monk O'Connor and Dan Hopman as the Webbs. Blake Thomas' authentic country voice and great musicianship on the slide guitar, banjo, fiddle, etc. (he's one of my favorite local musicians - check out his albums on iTunes). Tod Peterson's trademark humor as the alcoholic choir director. A sad story with a sad ending, but it's hard not to laugh at Tod's carefully practiced walk barely disguising the drunken stagger. Mary Fox's animal sounds coming from the audience and hilarious wedding outbursts. The surprisingly sweet Irish tenor of David Carey. The adorable and talented children, especially 9-year-old Natalie Tran and her sweet brother/sister relationship with David Darrow's George. A heartbreakingly beautiful solo by David towards the end of the second intermission, setting the tone for the somber final act. 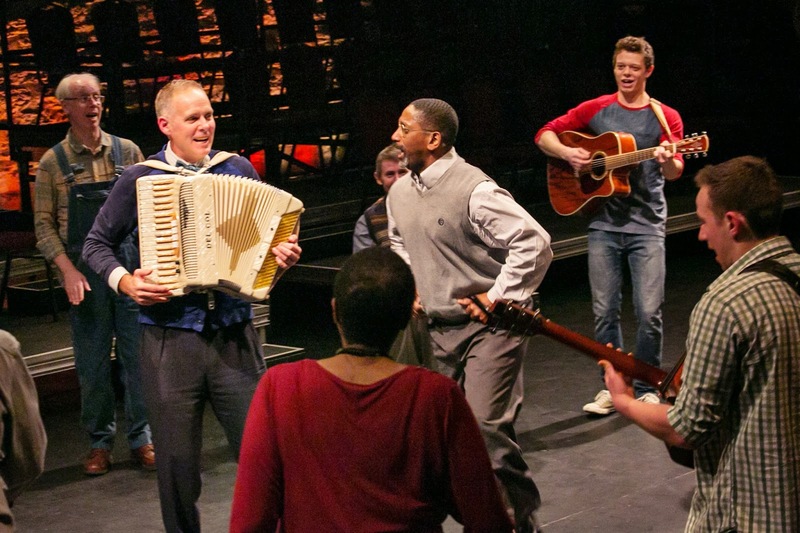 Our Town continues at the Lab Theater through April 6. Don't miss this chance to see an American classic in a fresh new music-enhanced production. It's simply beautiful. *For me, Our Town naturally comes with musical accompaniment, since the only other production of the play I've seen, at Yellow Tree Theatre three years ago, also had music. Blake Thomas and Mary Fox also appeared in that production, and are currently creating a live radio show from Duluth called Take It With You, to premiere next month. Check out their website and Stay Tuned to Cherry and Spoon for more info.